One full day of dedicated discussions on thyroid cancer. Starting with surgical anatomy, cancer diagnostics and addressing complex issues of imaging and decision making in management. Choosing type of surgery and management of neck will be discussed by renowned experts in the field. 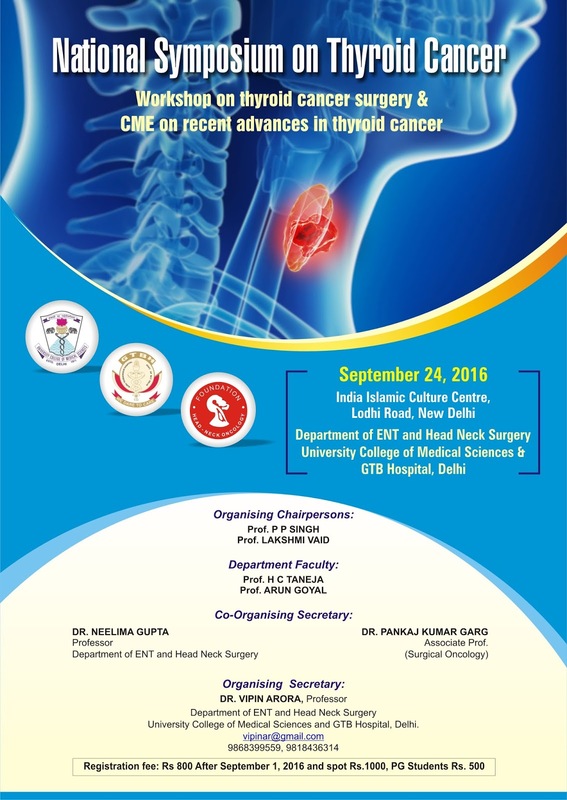 Symposium has dedicated talks on nuclear medicine issues in thyroid cancer, post operative surveillance and radiation therapy. Besides a very experienced host faculty, We have 17 + confirmed renowned guest faculty including Prof. Prathmesh Pai from Tata Memorial, Mumbai, Prof. Alok Thakar, AIIMS New Delhi, Moni Abraham Kuriakose, Mazumdar Shaw Cancer Center Bengaluru, Prof. Anil Bhansali, Endocrinology PGIMER, Chandigarh, Dr. Deepak Sarin, Medanta Gurgaon. Registration fee: Rs 800, after September 1, 2016 and spot 1000, PG students Rs 500.